Part Two of There Ya Go Again! The Putative 500,000-Year-Old Hafted Spear Points From Kathu Pan 1 VS Reality: What’s the DIF? In the previous blurt I did what I could to point out the problems with the putative spear point OSL dates from Kathu Pan 1. As promised, I’m now going to address the primary claim of Wilkins et al. 2012, that some of Kathu Pan 1’s pointy stone artifacts bear evidence of having been used as the business end of a composite armature, a projectile in fact, specifically, a spear. Let’s have a closer look at their argument. Shall we? 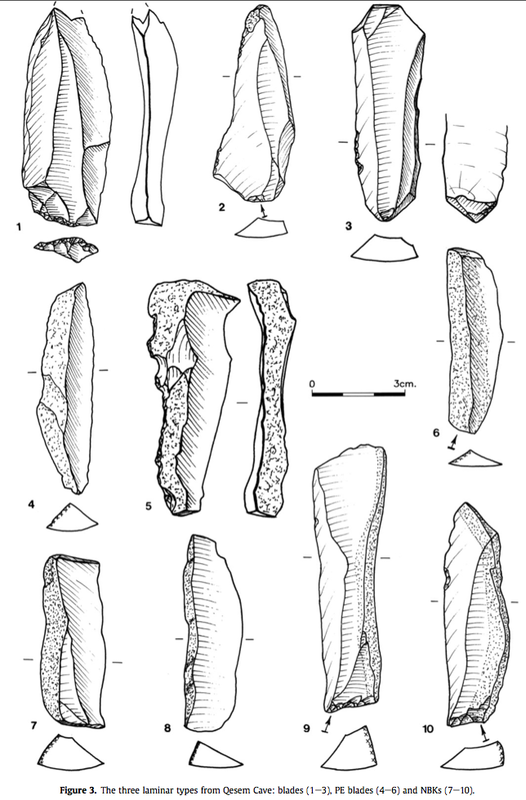 So, the authors start from the presumption that hafted spears were commonplace in the Middle Palaeolithic. Why not, then, suppose that the last common ancestor of us and them was also capable of putting two and two together, and making a spear? No reason not to, I guess, unless you’re suggesting that there’s a gene that codes for spear-making! Never mind. 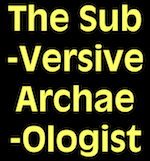 The authors feel that they must say something of the kind, since they’re getting ready to tell us about stone artifacts that they believe are contemporary with H. heidelbergensis in Europe. As you may have read in my previous post, the early dates on the alleged spear points are irrelevant. To summarize. 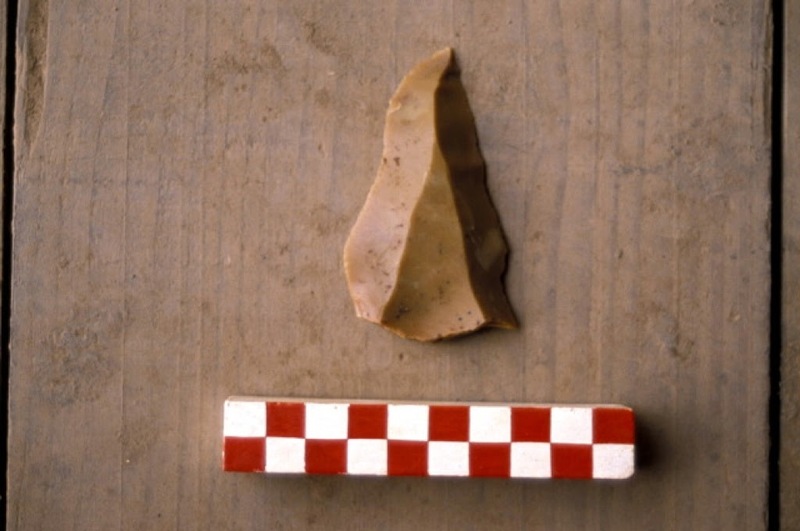 The artifacts in question derived from a spring vent that blew threw Stratum 4 at Kathu Pan 1 some time before the upper reaches of Stratum 4 were stripped away by an erosional process [most likely wind] and before Stratum 3 was laid down. You’ll remember that the very early dates of ~500 ka were estimates based on quartz grains drawn from the spring vent. And, of course you’ll have retained the knowledge that there is no way on God’s green earth to know whether or not the dated sand and the artifacts are in association. So, feel free to throw out the dates. It’s astonishing that the authors didn’t even flinch at the context of this collection of Kathu Pan 1 booty. And, as you’ll see, the rest of the paper is as confusing a a House of Mirrors at an amusement park. So, from what amounts to a lag deposit of stone artifacts and faunal remains found in a spring vent of unknown age, the authors recovered 210 pointy stone artifacts like the ones shown above. Of those, a mere 29 have at least one ‘Diagnostic Impact Fracture’ (DIF). These are of two kinds: step termination fractures (see below, item 1), occurring when a bending force is applied to the flake margin, whether that be where the two lateral margins converge (i.e. the ‘tip’) or on the margins proper. The other DIF is a burin removal [per se], which is a flake the axis of which follows a lateral margin for some distance, and terminates in a step or a hinge fracture or simply feathers out. The first kind of DIF, the step termination, can occur anywhere on a flake margin where the thickness and brittleness are such that a small flake can be removed by a force applied from either the dorsal or the ventral direction. By definition, where pointy artifacts are concerned, the burin fracture DIF can only occur at the tip. Such forces can and do occur at the tip and along the edges of true projectile points. However, other, post-depositional processes are capable of producing such modification, including trampling by all sorts of large mammals, from bipedal apes right on up to elephants. The authors are quick to admit that processes other than projectile impact can and do create such scars. Nevertheless, they are equally quick to rule those out, first by argument from authority. They state that ‘Similar-appearing fractures can result from post-depositional processes, although their frequency within assemblages is low.’ In dismissing post-depositional processes in this fashion and for this reason, they cite one paper, by Justin Pargeter, who undertook trampling experiments to see if pressing down on some home-made flakes in an artificial substrate was capable of creating DIFs. His results are tabulated below. Those that have been crossed out are not considered DIFs, per se. Pargeter attempted to control for the density of the substrate, and to account for differences in the strain resistance from one raw material to the next. However his efforts are a weak hook on which to hang Wilkins et al.’s sweeping dismissal of post-depositional processes. Looking at Pargeters table of results, above, you see that very few DIFs were produced during both the cattle and the human trampling parts of the experiment. He found that step terminating fractures were less common, although any comparison between single-digit results ends up inflating the differences. All up, out of 450 pieces over four trials using cattle and barefoot people, only four [count ’em, 4] flakes were found with step terminating fractures. Burination occurred on a slightly larger number, five. In other words, they’re not DIFs unless they occur on pointy stones. You can forget about DIFs that occur on amorphous flakes, because, clearly, they wouldn’t have been useful for piercing hide and flesh. So. To paraphrase, it’s random and inconsequential if the flake’s amorphous. It’s okay to think that pointy rocks with DIFs are spear points. Does this sound a bit suspicious to you, too? Albeit Pargeter’s experiments were carried out in good faith, their shortcomings aren’t trivial. For example, we know that substrate density will have a bearing on damage from trampling–for example, between sand and bedrock. Every kind of substrate in between sand and rock will yield a different result, as, moreover, would the size of the animal doing the trampling. Presumably giraffes, rhinos, and elephants would be capable of inflicting more damage to all sizes and shapes of flakes than cows or people. In the case of Kathu Pan, one can imagine that the water-seeking animals that congregated when there was standing water wouldn’t have been restricted to people and cows [or gnus, for that matter]. Nevertheless, Wilkins et al. think it’s quite all right to play down the role of trampling on the basis of Pargeter’s single experimental effort. This, as much as anything, gives lie to the remainder of Wilkins et al.’s paper. Now, as most of us are aware, replicative experiments demonstrate that a phenomenon can occur as a result of a particular set of actions. Nevertheless, they do nothing other than to suggest the means by which that phenomenon might occur. It’s a hypothesis. A starting place. Sufficient to explain the phenomenon of interest, but by no means necessary. Thus, while great fun, the authors’ experimental results are patently inconclusive, and oddly have very little bearing on their thesis. 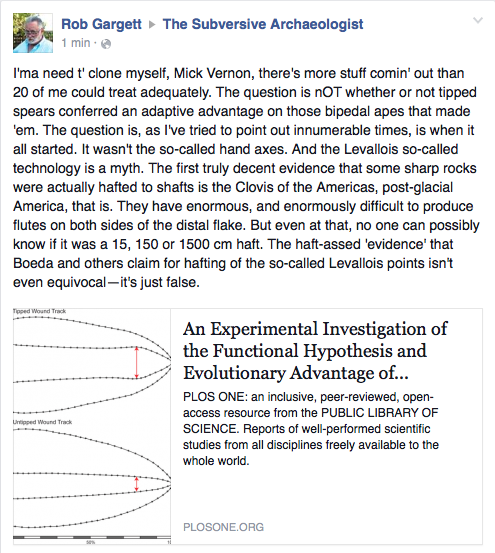 In addition, no amount of statistical tap-dancing can replace the kind of contextual evidence that would readily indicate the use they propose for such artifacts–a point embedded in an animal bone, for example, or, at a minimum, one associated with the remains of a carcass in an unequivocal manner. True, Wilkins et al. did find the KP1 points in association with animal bones. But, as I pointed out in my last outing, those items almost certainly came together as the result of post-depositional processes, and there can be no no way of knowing if the bones and stones were in association when the animals died or the stone points were discarded or lost. In this, I have to say, the authors’ naïvete is breathtaking. Perhaps knowing that their arguments were thin, they conduct one further analysis. They decide to look at plain old damage, rather than DIFs, as a means of diagnosing spear points from cutting tools. Apparently, in addition to the damage categories discussed above, the authors found a considerable amount of simple ‘edge damage’ on their experimental pointed flakes. Here, they think, is a means of getting at the function of the KP1 points without even bothering with DIFs (which, you’ll remember, were meant to be the diagnostic damage that sorts mere flakes from projectile points. Their analysis gets weirder by the minute. … we recorded the macroscopic edge damage that was evident on all complete points… . 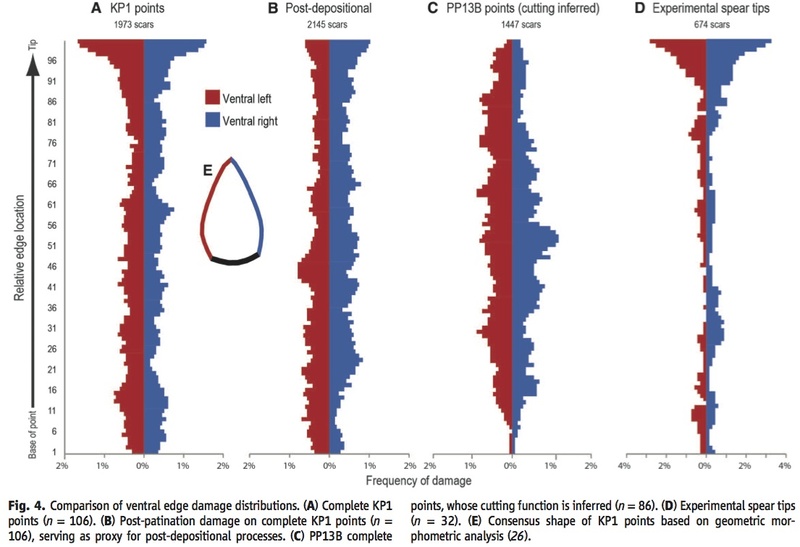 Edge damage was more frequent at point tips than along point edges, and distributions were similar between left and right sides (Fig. 4A [reproduced further down]). Taphonomic processes can be ruled out as the sole source of damage on the KP1 points. Post-patination scars, which are easily identified … [see below], reflect damage not related to use of the points and occur as frequently on point edges as point tips (Fig. 4B). In aggregate, the damage along the dorsal surface of the KP1 points was similar to the distributions of post-patination scars … whereas the damage along the ventral surface was different… Therefore, we focused on the ventral edge damage to test hypotheses about the function of KP1 points. From the look of the chip indicated in D, above, the ‘post-patination’ scars could easily have been made yesterday, the result of trowel trauma or the banging around that the artifacts must have experienced as the spring was bubbling through Stratum 4 at some unknown time in the past. And, is it just me? Or, do the authors plain fail to adequately explain why they focussed on ventral damage? It sounds to me as if they’re saying, ‘There’s no differences on the dorsal surface that’ll allow us to distinguish between natural and artificial edge damage. However, we see differences on the other surface that do, sort of, therefore we’ll only include the ventral damage in our analysis.’ Huh? I know. We should just write them off right here. But, whadda ya say we give ’em the benefit of the doubt for now. 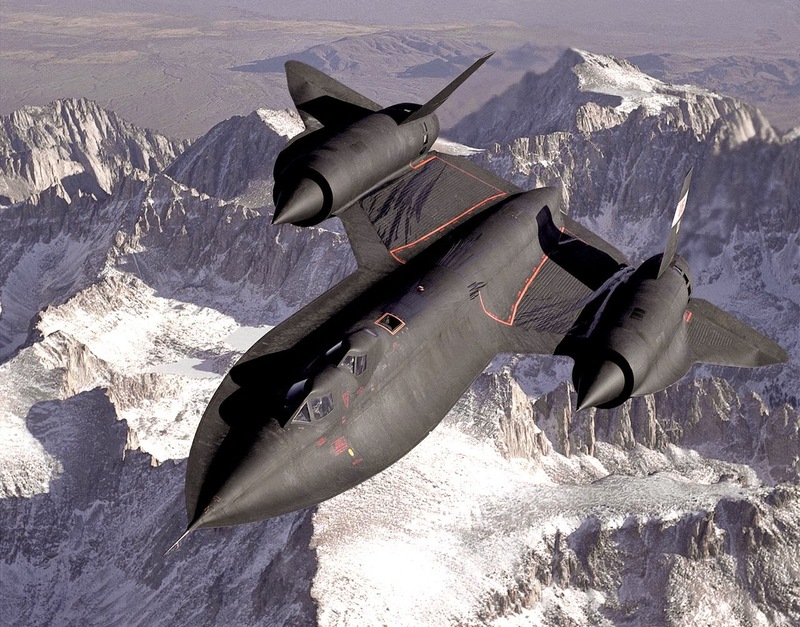 The illustration above depicts ventral edge damage to 106 of the loverly, pointy flakes–the complete KP1 points. Columns A and B are meant to show us that there is a ‘real’ difference between the locations of pre-patination edge damage (A) and those that occurred post patination (B). The authors recorded an extraordinary amount of damage on the KP1 points–an average of 38 scars per flake! The total of 1,973 in A are considered the result of use, and the 2,145 in B are said to be ‘post-patination’ [or, irrelevant to their analysis]. Notice that in A, a greater degree of use damage occurs distally than either the post-patination damage (B) or that of the presumed cutting tools from Pinnacle Point 13B. In all of this focus on edge damage to the exclusion of DIFs, the authors make no mention of the type of scarring–i.e. the morphologies–of the edge damage. You’d have thought that, if one class of damage were qualitatively different from the other there might be more reason to suppose that the differences were due to the different functions for which the points were intended. Especially curious is that the authors make no mention of the most likely reason, in a physical, mechanical sense, for both a qualitative and quantitative difference between edge damage on the dorsal surfaces of the KP1 points and that visited on the ventral surface. I’ll explain. Think of the cross section of the vast majority of MSA (Middle Palaeolithic) unifacial lithic flakes, which is how the authors describe their KP1 points. 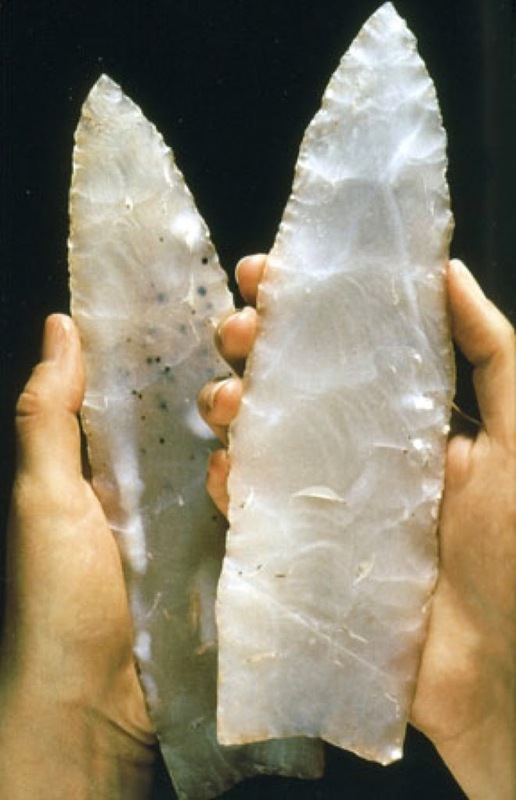 Those shown below are some ‘blades’ from Qesem Cave. Notice the ventral surfaces–the smoothly curved lower sides in the cross sections of examples 2 through 10. The ventral surfaces of these flakes would naturally be much more susceptible to edge damage in comparison to the dorsal side. That’s because of the additional mass on the dorsal side, which provides a natural buttress against bending force. Ask any knapper. A much greater force would be required to remove a flake from the dorsal surfaces of any one of the examples. 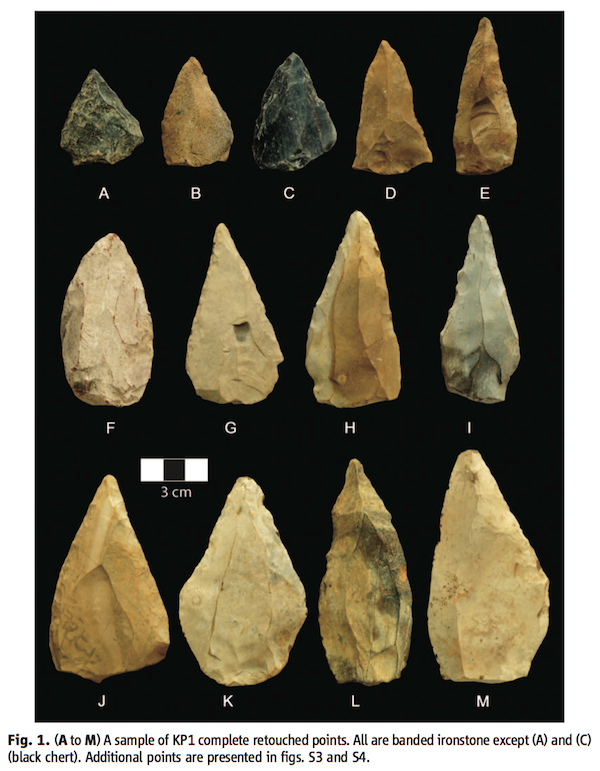 By now you should be as suspicious as I am about the veracity of Wilkins et al.’s claim to have found evidence of hafting and use of pointy rocks as projectile points. After all, a litany of shortcomings attends this paper. First, they have failed to accurately date the finds. Second, they have failed to imagine a wide enough range of possible sources of damage. Third, they have failed to take into account the greater natural susceptibility of ventral surfaces to incidental chipping compared to that of the dorsal. Fourth, they have failed to give a good reason as to why they didn’t include dorsal damage in their calculations, other than to aver that dorsal damage wasn’t diagnostic or otherwise helpful. But, on what grounds, one wonders? There are no data provided. I believe strongly that we should be allowed to judge for ourselves on this point, yet we’re given no help whatsoever by the authors. 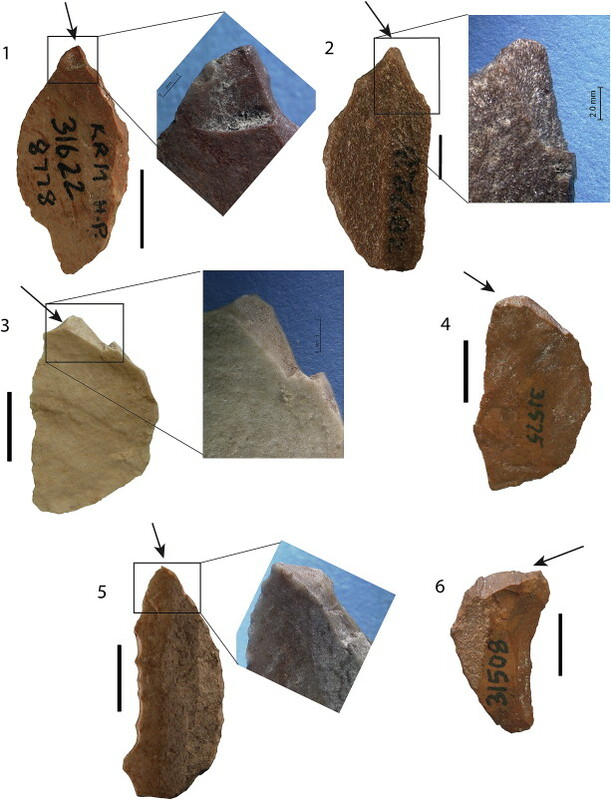 Once again I’m forced to say, as I did relative to Wilkins’s earlier article on the putative ‘blade industry’ at Kathu Pan 1, that the data presented are inadequate to support this latest, even more spectacular claim to have found evidence for composite tools deep in the Middle Pleistocene of southern Africa. This is going to be my last word on the subject. Promise. Sorry. Can’t resist. One more word. I find it sobering that the Science referees failed to notice even one of this paper’s methodological and analytical shortcomings. But then, I guess we should be getting used to that, by now.